Today is a great day for Atlanta Falcons fans. 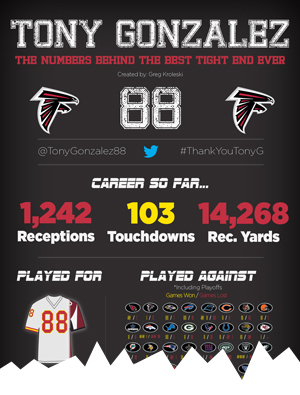 All-Pro tight end Tony Gonzalez announced he is coming back to play for one more year! To celebrate, lets take a look at some stats from Tony’s career and see why he is often praised as the greatest tight end of all time. And here is the full infographic, which hopefully has loaded by now. To see it glorious full size, click the image below and then magnify it on the next screen. Enjoy! I originally started this project as a way to dig into Tony’s stats to show that he should return for at least one more year. When I realized that his decision was largely based on personal matters – not stats – I decided to call an audible and instead make an infographic to either celebrate if he announced his return or to look back on his career if he chose to retire. I for one am glad we get to watch him play for one more year. Thanks for enjoying my work! Tonight I finished the infographic I’ve been working on for the past seven weeks. Two versions of it actually, one for if Tony G. retires and one for if he comes back to play another year. They are fairly similar, but with subtle differences in the presentation in order to change the emphasis of the message. I suppose at some point I can put them up side by side to see if those subtleties are achieved. I’m actually a bit torn right now because I like the version for the retirement scenario better, but I’d rather get to see Tony play for another year. Like any project, once I finished the first 90%, I could start on the second 90%. There was a good bit of polishing to do but I’ve actually tried to do some of it as I went, mainly when I was stumped on something else. The final thing I worked on tonight, but have yet to make a decision on, is the copyright status I’m going to put on the image. I normally default to throwing up ‘Copyright 2013’ on whatever I make (though that isn’t necessary under US law) but with this one I’m not sure if it fits the project. This infographic, like all of my innovation sessions, isn’t for profit. In order to focus on the innovation parts of the projects, I’m relying on anything pre-built wherever possible. The data, logos and some of the graphics are pulled from other sources – so I feel bad throwing a copyright on it – even though I could probably get away with it under fair use. 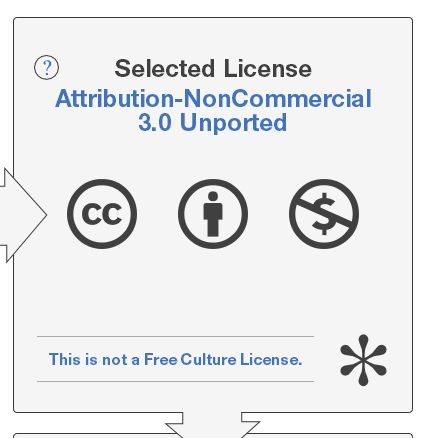 I’m currently leaning towards a creative commons license, for attribution and non-commercial. I don’t really want to see someone printing out the infographic I’ve made and selling it for a profit, but have no problem with anyone else sharing it on their fantasy football blog, website, etc. I’ll probably sit on this decision for a bit and make a call on launch day. Done! Pretty much anyways. All of the major data for the infographic is now in place – I’m sure I’ll make a few final tweaks, but for the most part I’m pretty happy with it. Tonight I spent most of my time wrestling with a few ideas of how to present comparisons between Tony G. and the current crop of Tight Ends in the league. 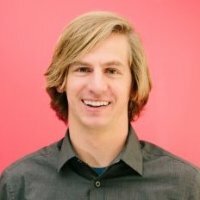 I started with the idea of normalizing per season, but realized that most athletes, Tony included, experience their top performance in the early half of their career.Also, many athletes, Tony excludes, get injured as they get older and start missing games or have to stop playing all together. I had a thought that I would project out the averages of each player into the future to predict when would be the soonest they could catch any of Tony’s current records. As I started working on it though, I just wasn’t comfortable with having the data be based on something so theoretical. I thought about comparing the first N years of Tony’s career to the careers of younger players – but that story wasn’t very compelling. The data didn’t show much – and there was a lot to account for in the fact that a good portion of the redefinition of the Tight End role happened because of Tony and during his career – so years 1 & 2 of players who were drafted in 2010 would be very different than Tony’s in 1997 & 1998. I ended up deciding on sticking with the normalized yearly averages. To add some depth to the visualization I included stars for how many years they player has been in the NFL – thus adding a bit of context to the stats. Averaging nearly 1,000 yards per season for 16 seasons is a much stronger stat than 1,000 for 2 seasons. Here is a sample of the what I showed for Jimmy Graham – I like that it makes it easy to put context around how the two players compare. 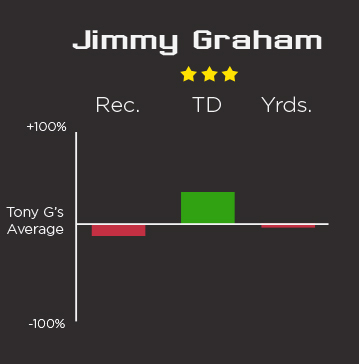 We can see that Graham is a TD producer but still behind Tony’s averages for receptions & yards receiving. This is of course only 3 seasons into Graham’s career & he’s had a guy named Drew Brees throwing to him for all of them so who knows what the future holds.